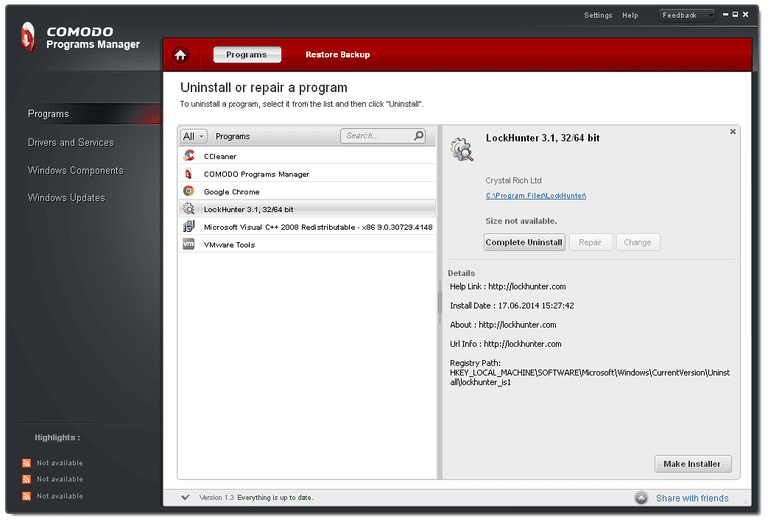 Comodo Programs Manager is one of the best free software uninstallers. It automatically monitors the changes a program makes during its installation so it can be completely removed when you choose to uninstall it. Among other advanced features, programs are automatically backed up before you remove them so Comodo Programs Manager can restore an application you may have accidentally uninstalled. This review is of Comodo Programs Manager version 1.3. Please let me know if there's a newer version I need to review. An advanced tool is built into Comodo Programs Manager that provides a very simple way of backing up your programs. By default, Comodo Programs Manager will monitor all program installations. This means after you install it, every new program you add to your computer will be recorded by Comodo Programs Manager. This is done so that if you decide to remove the application, every single file, folder, and registry item can be quickly found and effectively removed to leave absolutely nothing behind. While this is great to avoid collecting extra clutter, it's also beneficial for a couple other reasons. Once a program has been monitored by Comodo Programs Manager, you can choose Complete Uninstall to have it completely removed from the computer. After doing this, you'll be shown every file, folder, and registry item that the program added to the computer but wasn't removed using the uninstall wizard. You can then selectively remove some of the data that was left behind or delete it all. After removing a monitored program, you can open the Restore Backup portion of Comodo Programs Manager and select the program from the list. You can see all the files, folders, and registry items that were removed and restore some or all of them. Restoring all of them will place the application back on your computer in the same state it existed in when you removed it. Restoring a backup requires the Make backup when uninstalling a monitored application option in the settings to be enabled. Another benefit of monitored applications is that they can be converted into self-extracting executables that provide an easy method of reinstalling a program on any computer, even if it didn't originally exist on that computer. This works by clicking Make Installer on a monitored program. All the program settings, files, folders, and registry items will be packed into a single file that, when opened, Comodo Programs Manager will extract and apply to the computer. Programs that were installed before Comodo Programs Manager are uninstalled like a regular program. This means Comodo Programs Manager won't search for registry items remnants or file system clutter when it removes it, nor will it backup the program before uninstalling it or allow for a self-extracting install file to be created. Comodo Programs Manager is a very advanced program, so much so that I'm surprised it's free. I highly suggest installing this to a new computer so you can take full advantage of it for every program you install. When you right-click a program and choose Uninstall using CPM, it's uninstalled without opening the full Comodo Programs Manager program, which is really nice. Also, some program uninstallers that support context menu integration work only if the application's shortcut is on the desktop. Comodo Programs Manager is superior in that any EXE file associated with the program can be selected. I also like that, due to the very nature of the monitoring feature, monitored applications are removed much quicker than regular programs. Something I'd like to mention is the Application Contribute Program option in the settings. If enabled, this will allow Comodo Programs Manager to upload the registry and file location of your installed programs to a shared database so other users will have the ability to completely uninstall their applications even if they don't have them monitored using their version of the program. It's essentially sharing the information of your monitored applications with other Comodo Programs Manager users. Comodo Programs Manager unfortunately doesn't work in newer versions of Windows. This is the only major downfall I can find. CPM includes all the features that other great program uninstallers provide, plus more.